Part of my updated gallery wall was peaking out in my post on Monday, so I thought I'd share pictures with you all on how it stands today. 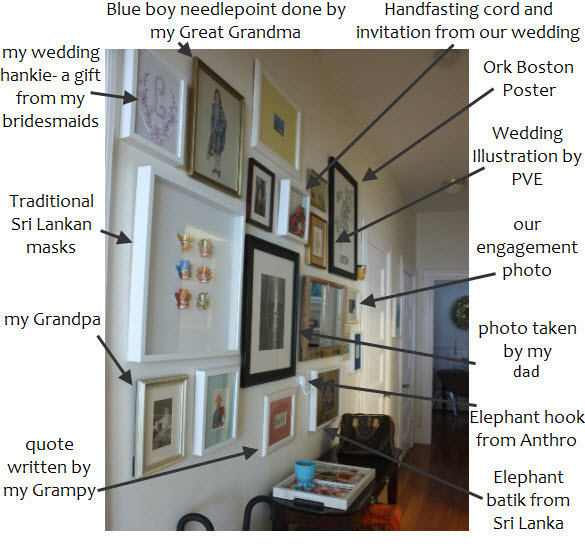 As a refresher, this is what it looked like for the LONGEST time because someone I live with hated the idea of a gallery wall. I won't name names. It is close to impossible to get a good photo of this wall. It's in a hallway, there is zero natural light , and the fact that I don't have a go go Gadget camera to get the right shot makes things difficult. I guess you could call my gallery wall a scrapbook of sorts. That's my new name for it, the Scrapbook Wall. Tell me, do you have a Scrapbook wall or even a piece of art that brings back wonderful memories? I love it! And I love that everything has personal meaning - it makes it even better. My gallery wall is in the hallway as well and I smile every time I walk by it because of the personal things we included. Great job!! Question - do you find that the wall is easy to add more frames to, or do you suggest going ahead and mapping it all out and keeping it that way to prevent asymmetry? I have two scrapbook type walls. Our stairwell has become my gallery. Art pieces that are all sizes and funky by me or other artists (predominately local to my area) are what adorns this one. And now with the birth of my son I have begun a family inspired one in our front entryway. I love it. Your wall looks amazing!! I aspire to have mine as such. Love the way you've mixed different colored frames, and non-matted and matted pictures. I've always been nervous about doing that but your hall is a great example of how a "mish-mash" of stuff can look really put together. 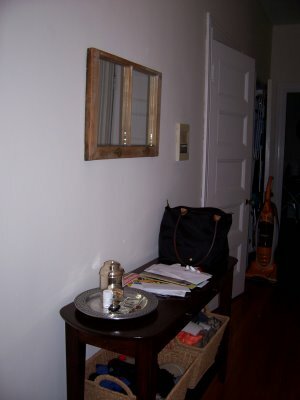 Love the finished umbrella stand, too! Patricia, yours might be the most important piece up there! It was the inspiration for our wedding and means so much!! Love, love, love it! All the memories and your other inspirational pictures together where you can enjoy them every day. I love your wall and all the meanings behind it! Beautiful! Your gallery so MAKES that space! I'd love to do this, especially with all the sentimental items like you've included in yours.